The digital mapping company, MapQuest, has changed a lot in the last 5 years. 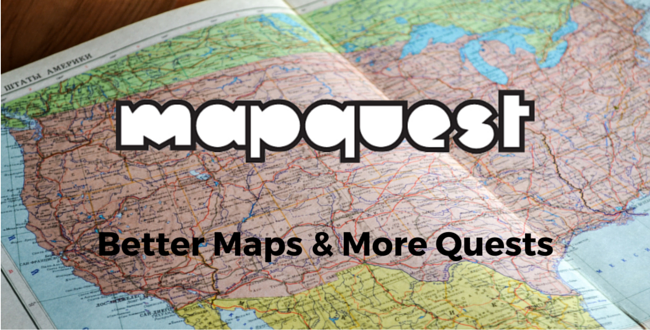 Once the seemingly unsurpassable market leader in mapping services, MapQuest, like countless corporate dinosaurs before them was in danger of extinction themselves. With the rise of smartphones and mobile computing, competition became fierce. Tech powerhouses like Google and Apple with their billions of dollars and popular devices to house their mapping software on presented a challenge that MapQuest couldn’t have foreseen at their inception. Other mapping services, like Waze and Scout, which boast real-time traffic information was unfathomable even just a few years ago. MapQuest had a choice, they could go the way of Blockbuster Video or Woolworth, or they could reinvent themselves. Since the new generation of mapping services focus on getting users from point A to point B as quickly as possible, MapQuest saw the potential for a unique approach to provide their users with additional value. Instead of just focusing on getting users to their destination, MaqQuest is attempting to give people a human touch in addition to their navigation services with Parachute. MapQuest’s Parachute site was launched in October of 2015 and was developed to take their audience inside a destination. Articles, such as Five Offbeat Places to Visit in Milwaukee or Worst Places to Visit in Salt Lake City give readers an insight into a destination that a spatial map, even with data from every coffee shop to every yoga studio in a city, could possibly ever give. Parachute Senior Editor, James Kerley, explained, “Initially, Parachute started as an experiment. We wanted to see how people would respond to more editorial content that was, in a creative and fun way, tied to maps.” Rather than mindlessly going from point A to point B, Parachute gives users insight into local hotspots, things that you can’t miss if you’re in the area, or any other need-to-know information on that location. There are so many other destinations between point A and point B, and MapQuest is trying to get their users to experience them. MapQuest’s Parachute is based upon an already existing business model of user delight. Even in the height of MapQuest’s dominance in the print-out directions industry, people were surprised when they would call MapQuest’s customer support line and be greeted by a human being. Parachute is another example of this. Who else can talk about the best restaurants or top bars in an area other than locals? And who else knows location better than MapQuest? Google and Apple both have a technological competitive advantage against MapQuest. Google’s fleet of imaging devices are ensuring their Google Maps product is constantly updated and made as accurate as possible. Instead of trying to compete with these tech giants, MapQuest has pivoted to allow users to not only find destinations with accuracy, but they can also find a destination they didn’t know they were interested in. Did you just watch “Independence Day?” Check out the Top 3 Places to Find a UFO in the United States. Tired of the same old ski resorts? Look no further than The Five Strangest Places to Go Skiing. Even if you can’t drum up the $27,000 to ski in Antarctica, the article was still a fun read. The best part about Parachute lies in its authors. They’re all freelance writers who’ve opted into sharing their opinions. Because of that, MapQuest can count on these contributors to supply authentic, local, and searchable content. Additionally, these authors come from a variety of backgrounds. Some have only written a couple travel blogs in college while others have contributed to major media outlets like the NY Times. Regardless of their writing skill, these contributors have all displayed one distinguishing characteristic: they all passionate writers and passionate about where they’re from. Some writers have a love of hiking, and they share their area’s top hikes with a twist and write a post titled North Cascades Trails & Ales: Post Hike Beers at the Bottom. Others really enjoy eating out on the town, and they write pieces like Top 5 Dog-Friendly Restaurants in NYC. MapQuest is not as concerned with writing expertise, rather, they are looking for a strong opinion that can give people a sense of direction, even if it is one they didn’t know they were looking for. Some of the contributors have written some really great content, and their creativity has inspired a plethora of mapping-related content. For example, a few posts have been written that allow users to either avoid travel in certain areas that Donald Trump may visit or find ways to travel like The Donald. Locations that are “Trump-free” include Mexican restaurants or libraries. A Trump-friendly location might be a round of golf at a particularly expensive 18-hole course. It’s important to note that these articles are not politicized in any way; their purpose is to give people an interesting and relevant way of looking at maps. This cartographical ingenuity shouldn’t be stopping after the presidential election. MapQuest is taking their expertise in getting people from point A to point B, and combining that with local user insight to give their product a boost. The ability to choose between a point C or D hasn’t been accomplished by Google or Apple in their respective mapping products. Only MapQuest has had both the awareness and capability to implement such a program. For a content marketing strategy tailored to you, contact us here at Revenue River Marketing. Follow the latest trends and learn some tips and tricks by subscribing to our blog below.